Wie bekomme ich die Pfeile (shortcut arrows) auf den Icons des Windows 7 Desktop weg? Für Windows XP gab es da ja Tweak UI, wie mache ich das aber bei Windows 7? Grundsätzlich wird der Pfeil als Bild Overlay über die verknüpften Icons gelegt. 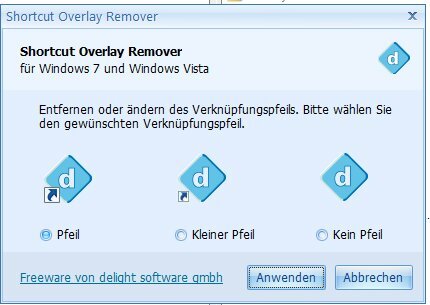 Im Internet gibt es verschiedene Tipps, einfach in der Registry den Eintrag für dieses Overlay auf eine transparente oder ‚blank‘ Icon Datei umzulenken. Diese muss aber erstmal irgendwo hin und sollte auch dort bleiben, um am Ende nicht in jedem Icon ein schwarzes Viereck (black square) zu sehen. Es gibt im Windows Verzeichnis die Datei \System32\shell32.dll, welche viele Systemicons enthält. Das Icon mit der Nummer 52 ist transparent, also nimmt man dieses als Ersatz für den Pfeil auf den Verknüpfungen. Nach einem Neustart sind dann die Pfeile auf den Icons der verknüpften Programme verschwunden. shortcut arrows win7 No mouse, no problem. Move from one box (meaning it require input) to another box, as most T&C. Use the TAB key (mostly show 2 arrows point differently) on top of the CAPS LOCK key. Create a desktop shortcut for sound scheme in Windows 8 Please press the Windows-8 key combination [Windows Logo] + [D] to see the Win-8 desktop. I have a dual monitor setup, my primary and the second monitor is actually a large TV which is usually off. If windows are left open on the TV like windows explorer I have to Using the Icom IC-7300 with Thanks Frank for the description I met the same port and port speed experiences which wrote from. I want to present my view to third interconnection. Tags: using, icom, 7300, Stack Exchange network consists of 175 Q&A communities including Stack Overflow, the largest, most trusted online community for developers to learn, share their knowledge, and build their careers.